This Filipino dish is a crowd favorite because of its tangy tamarind base. 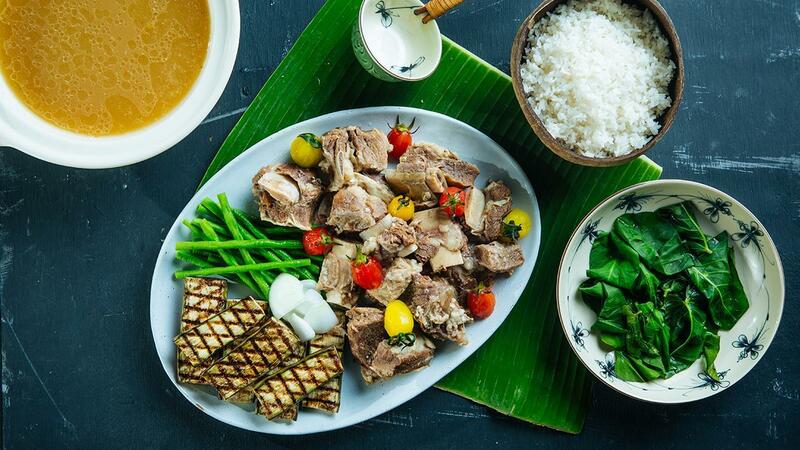 Sinigang goes well with a variety protein like seafood, pork, and beef -- which makes it easy for Chefs to experiment with their menus! In a heavy bottom sauce pan, heat the oil and saute onions and garlic until fragrant. Add the tomatoes and the white radish. Add the beef. Season with fish sauce. Stir until the beef turns brown. Add the water and the Knorr Beef Broth. Let it bring to a boil, then turn it down to simmer. Skim the scum. Simmer for 3 hours or until the beef becomes tender. When beef is already tender, add the finger chilies and Knorr Sinigang Sa Sampalok Mix. Taste and adjust seasoning with fish sauce. Turn off the heat, then add the kangkong leaves. Heat a separate grill pan. Drizzle the eggplant with oil and season with salt and pepper. Grill the eggplant. When done, set aside in a tray covered with foil until ready to use. Strain the ingredients from the broth. Arrange the beef and vegetables including the grilled eggplant on a serving platter. Soup to be served separately.